ALPHARETTA, Ga., December 5, 2013 – BioVentrix’s innovative Revivent™ Myocardial Anchoring System for the treatment of congestive heart failure features a tether component made of Zeniva® polyetheretherketone (PEEK) resin from Solvay Specialty Polymers for high strength and biocompatibility. Prior to the Revivent™ System, reshaping of the left ventricle required an invasive procedure known as Surgical Ventricular Restoration (SVR), which required stopping the beating heart and supporting it with cardiopulmonary bypass while significant incisions into the heart muscle are made to excise the scarred, non-functioning (ischemic) ventricular tissue. In contrast, the LIVE™ procedure using the Revivent™ System is performed without need of a cardiopulmonary bypass or making incisions into the heart. The Revivent™ System has earned the CE (Conformité Européenne) mark which demonstrates compliance with numerous EC directives, enabling it to be sold throughout Europe. To date, more than 50 patients have been successfully treated with the Revivent™ System at leading European heart failure centers. The unique anchoring system consists of two polyester fabric-covered anchor heads made of titanium. A flexible tether made of Zeniva® PEEK functions as a type of zip tie and is used to squeeze the anchors together and hold them in place. BioVentrix machines a flat PEEK sheet with a thickness of 0.040 in (0.1016 cm) into rectangular shapes that are 0.040 in. wide x 0.065 in. deep x and 12 in. long (0.1016 cm x 0.1651 cm x 30.48 cm). The anchor heads and tether are attached with eyelets and cam locks. Zeniva® PEEK – part of Solvay’s line of Solviva® Biomaterials that are offered for use in implantable medical devices – has a modulus very close to that of bone combined with excellent toughness, biocompatibility, and fatigue resistance. It is certified to meet the full requirements of the ASTM F2026 standard for PEEK used in implantable surgical devices. The material was chosen over polyurethane and nylon for its strength and biocompatibility, according to Kevin Van Bladel, vice president of research and development for BioVentrix. 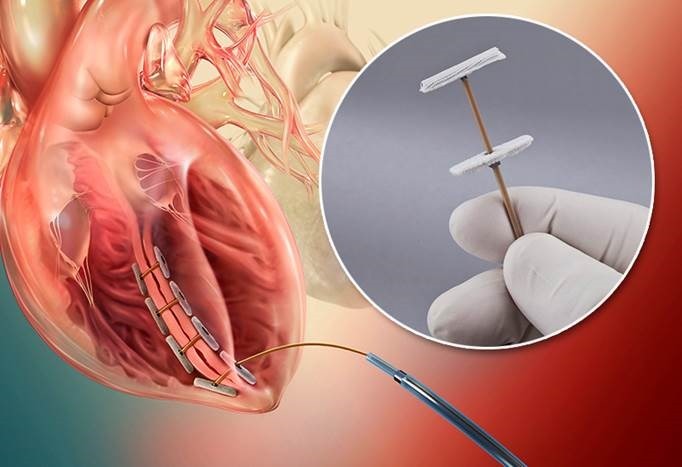 “Zeniva® PEEK has been tested and validated for implantable devices and we are confident it will behave well in an environment where it needs to withstand the pressure of a heartbeat for the life of the patient,” explained Van Bladel. Zeniva® PEEK has undergone fatigue testing equivalent to 15 years of simulated use and thus far two years of clinical data with patients have been gathered. BioVentrix also plans to use Zeniva® PEEK in a second-generation device, the Revivent-TC™ Myocardial Anchoring system, that uses a minimally invasive catheter approach. Based on biocompatibility testing, Zeniva® PEEK demonstrates no evidence of cytotoxicity, sensitization, irritation, or acute systemic toxicity. It also boasts high strength and stiffness and has radiolucent properties which enable x-ray procedures without interference. In addition to Zeniva® PEEK, Solvay’s Solviva® Biomaterials line includes Proniva® self-reinforced polyphenylene (SRP), one of the world’s stiffest and strongest unreinforced thermoplastics that offers exceptional biocompatibility and hardness; Veriva® polyphenylsulfone (PPSU), which provides unsurpassed toughness combined with transparency and excellent biocompatibility; and Eviva® polysulfone (PSU), which offers good biocompatibility and practical toughness in a strong, transparent polymer. These sterilizable products are available in injection molding and extrusion grades as well as rods and plates for machined components.